The editor of a Welsh weekly has stepped down to pursue a new career in communications with the NHS. Emma Bryant, pictured left, worked her last day at the Carmarthen Journal yesterday after two years in the role. Emma is set to take up a position with NHS Wales for the ARCH regional health programme, which aims to bring better healthcare provision to the people of South West Wales. Her role at the Journal will be taken on by Rebecca Davies, editor at Local World sister title the Llanelli Star, who will also retain her current position. Both Emma and Rebecca took over at their respective newspapers in July 2013, and Emma’s move comes as both titles prepare to come under the control of Trinity Mirror following its takeover of Local World. Emma began her career at the South Wales Evening Post in 1999 as the classified office junior and then became a trainee journalist, before moving quickly onto the sub-editors’ desk. 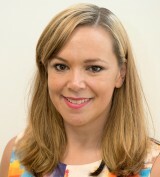 In 2010, she was promoted to the position of production editor of the Evening Post, the Journal and the Star as well as Swansea Life, Business Life and Cowbridge Life magazines. Her promotion to the Journal’s editorship came after Jonathan Roberts left to take charge of the Evening Post. During Emma’s tenure, the Journal launched its monthly famring supplement West Wales Farmer and marked its 205th anniversary in April this year. Last month she also welcomed comedian Rhod Gilbert into the paper’s offices to undertake a week of work experience for a BBC TV programme. The episode is set to air in the New Year. The NHS seems to be full of ex-journos. A sad loss, but unsurprising seeing how journalism is treated by management in this neck of the woods. How bitter Jeff Jones comes across these days. It was a pleasure to work with Emma at the Evening Post, and I’d like to wish her every success in the next stage of her media career. Good luck Emma. Let’s hope there’s a few newspapers left to publish all those lovely press releases.